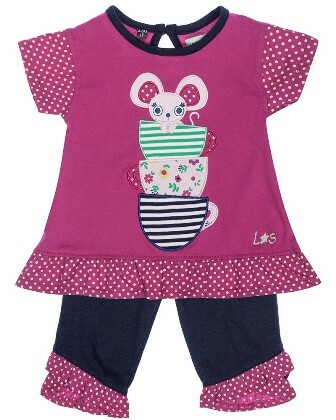 Our Country Mouse character balances on vintage china tea cups in this cute applique tunic set. Made from our premium cotton jersey fabric, the tunic top and cropped bottoms have pretty dotty woven trims. This outfit is the perfect new baby gift for baby girls.